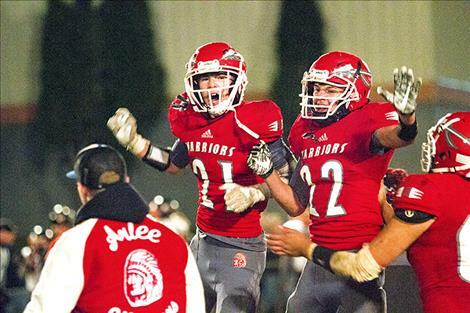 The Arlee Warriors celebrate a victory. Arlee Warrior George Shick sacks the Plains’ quarterback. 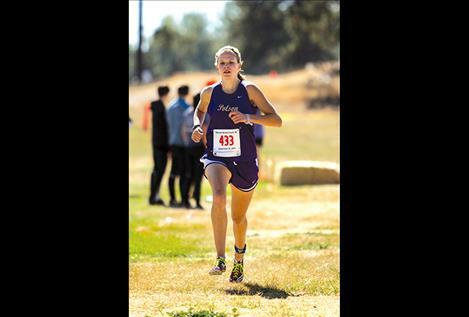 Lady Pirates’ Beatrix Frissell, shown competing during a meet in September, earned first place at State last weekend. HELENA - Polson Lady Pirate Beatrix Frissell won the individual Class A girl’s cross-country state championship on Saturday at the Bill Roberts Golf Course in Helena, running the 5K in 19:15.82 while beating her last season third-place finish. The Polson girls’ team finished third overall while the boys finished sixth. Quin Stewart was the top finisher on the boys’ team at seventh-place with a time of 17:11.22. James Normandeau led the way for the Ronan Chiefs with a ninth-place finish, running a 17:17.70; while Lindsey Brooks (21:12.05) was the top finisher for the Ronan Maidens. At the Class C level, the Charlo boys claimed a fifth-place finish and the girls finished eighth. For the Vikings, Wills Degrandpre (18:03.18) finished fourteenth and Brooklyn Foust (22:56.81) finished in the top 25. BELGRADE – The Polson Pirates were shut out 2-0 on Saturday afternoon by defending Class A Champions Belgrade Panthers in the state semifinals at the Belgrade Youth Sports Complex. The unbeaten Panthers (13-0) defense held the Pirates to five shots. The Pirates finish the season 11-2-1 and Belgrade will host Whitefish for the championship next Saturday. ARLEE – With only 11.1 seconds left in Friday night’s game, Arlee Warrior junior quarterback Lane Schall threw a six-yard touchdown pass to Darshan Bolen to give the Warriors the 44-36 victory over the visiting Plains Horsemen. 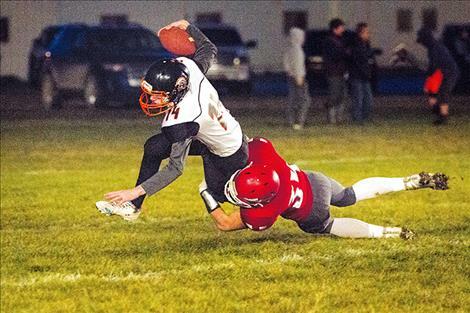 The win gave Arlee the third seed out of the Western Class C in the upcoming playoffs. On the night, Schall passed for three touchdowns and rushed for another. Bolen caught two of Schall’s scoring strikes for 48-yards and six-yards and rushed for a two-yard touchdown. CHARLO – On Friday, the Charlo Vikings handily defeated visiting Clark Fork (Alberton-Superior) 48-22 in a non-conference game that had no effect on the playoffs. Tyson Petticrew had 105 yards passing and 173 yards rushing for the Vikings. Petticrew threw one touchdown pass and rushed for another five touchdowns with the longest being a 70-yarder. DRUMMOND – The Mission Bulldogs fell 34-30 on the road to the unbeaten and third-ranked Flint Creek Titans on Friday. Bulldog quarterback Troy Mitchell tossed a 36-yard touchdown pass to Wacey McClure and Isaac Dumontier threw a 59-yard strike to Flint McPherson. Layne Spidel scored twice while rushing the ball nine times for 36-yards for the Bulldogs. BROWNING – The visiting Ronan Chiefs fell 42-16 to Browning on Friday. In the season-ending game, a touchdown reception by Ezekiel Misa and two-yard touchdown run by Noah Cheff were the only scores for the Chiefs, who finished the season 2-6 overall and 2-3 in conference. 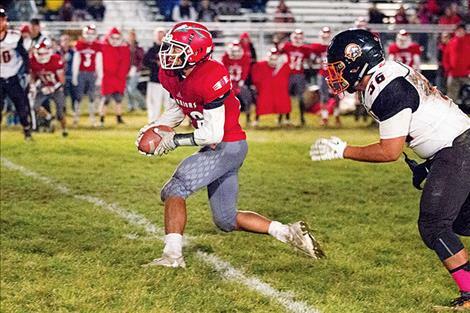 COLUMBIA FALLS – On Friday, in the regular-season finale, Columbia Falls defeated the visiting Polson Pirates 50-6. The Pirates finish the season 2-6 overall and 2-3 in the Northwest A conference. For the Pirates, quarterback Bo Kelley went 9-for-20 for 119 yards and an interception. Kelly also threw a late fourth quarter touchdown pass to Haden Smith. CHARLO – Kaitlin Cox had 10 kills and two blocks to help Charlo sweep visiting cross county rival Arlee 25-23, 26-24, 25-23 in Class C conference action on Thursday. Teaira Truman added 15 assists and two blocks for the Lady Vikings. Ashley Revis led Arlee with 12 kills and a block. Earlier in the week, Charlo defeated visiting Noxon in five sets 22-25, 25-20, 25-21, 20-25, 15-13. Cox had 19 of the Lady Vikings 36 kills and four aces. Allie Delaney added 13 digs and a game high eight blocks. ARLEE – On Oct. 17, Arlee added their twelfth win of the season with a home sweep of Plains, 25-21, 25-10, 25-23. Mikayla Rieken tallied 10 kills and floored eight aces for the Scarlets. Fellow Scarlet Nellie Desjarlais had two blocks and seven aces. WHITEFISH – In a Class A conference matchup on Oct. 17, Whitefish swept visiting Ronan Maidens 25-14, 25-8, 25-9. The Maidens had 16 kills, one block, 19 digs and one ace during the match. On Friday, Ronan ended their season with a win topping hosting Browning 25-15, 20-25, 25-23, 25-14. Madeline McCrea had 10 kills and six blocks, while Tiana Ulutoa added four aces and 30 assists for the Maidens. EUREKA – The Mission Lady Bulldogs fell 25-19, 25-10, 25-8 to hosting Eureka on Saturday. Afton Brander led the Lady Bulldogs with three blocks and three kills. The Lady Bulldogs had five aces, 13 kills, eight blocks and 42 digs in a 17-25 16-25 21-25 road loss to Anaconda on Oct. 17. MISSOULA – The Polson Lady Pirates posted a 2-12 mark in volleyball pool play during Thursday’s action at the Missoula Invitational volleyball tournament. On Friday, Polson lost to Helena in the opening consolation round. In a Class A conference matchup, the Lady Pirates were defeated by visiting Columbia Falls in five sets 24-26, 25-20, 22-25, 25-23, 15-13. Kyler Lundeen led the Lady Pirates with three aces and a game high 45 digs. Laurel Bitterman added 40 assists and Kaelyn Smith had 25 kills, both girls had game highs in their respective categories.